Tell A Friend… about YSE! Our regular guests are our best ambassadors, and we would like to thank you for spreading the word! It’s only human nature to keep a bit quiet when you’ve found something you like at a reasonable price, but we want to reward you for telling your friends about YSE. The best advertising is word of mouth. To encourage you to tell your friends about YSE, we will reduce the cost of your own YSE holiday by 5% of the cost of any reservations from new clients who mention your name on booking. We’re assuming your friends will be nicer than some odd or sod who’s found us via Google, which is why this works for us too. The new guests can be part of your group or travel separately from you. 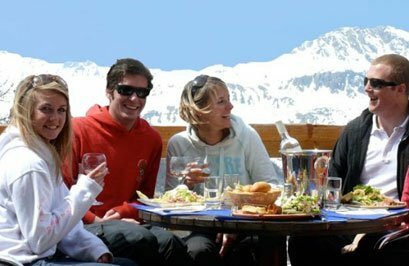 Even if only two people recommended by you take up your suggestion, a small discount off your own holiday would pay for your lift pass, or a new ski suit! Every little helps. Send us twenty new guests and you could earn yourself a free holiday! Send a group text or email to everyone you know (and like), and we’ll do the rest. To qualify you must make a booking for a 2018-19 YSE holiday and have travelled with YSE before. If you can tell us when you came, where you stayed or the name of anyone else in your party this will help us find your records. You, the former YSE guest, must let us know at the time of booking your holiday that you are bringing new guests as part of your booking (and so claiming the 5%). Any friends who have heard of YSE through you and are coming separately must mention you when they book, then you must make the claim for the 5% when you book your next holiday. The offer cannot be claimed at a later date if no mention was made at the time of booking. The friends we reward you for cannot have travelled with YSE before. The 5% offered will only ever be “redeemed” in the form of a reduction on your own holiday next winter. There will be no cash or cheque payment made under any circumstances. The 5% will be calculated from the basic cost of your friends’ holidays. It will not include any extras (ski pass, optional extras etc). There is no limit to the number of friends you can introduce! Only one reward can be claimed for each new friend. The first YSE guest mentioned by the friend will be the person who receives the reward. Sadly, we can’t offer this reward if you make a booking through an agent or if the person being introduced has booked through an agent. If the friend introduced makes a booking and then cancels, we reserve the right to reduce, cancel or even claim back the reward according to the cancellation charges applied.